Of course, you can sing along with the music that you play. You can also sing songs to your kids and have them sing with you, when they’re able. (And no excuses about you sounding like a frog.) On our recent trip, I tried singing some rounds with my kids (like “Row, Row, Row Your Boat”) and, though giggling became a big part of it, it was time well spent. When your children are still small, make a habit of narrating what you see as you drive along, connecting your observations and thoughts to their young lives when you can. Remember, along with reading aloud, the most powerful way of nurturing early language development is by providing ample input through speech during the first few years. As your children become more communicative, make a conscious effort to be chatty. Engage them in conversation by asking questions about their experiences, their thoughts, and their feelings. I’m reminded of the surprising discussion I had with my daughter when she was 8 years old. When you want a younger child to try speaking more in the minority language, give this little game a go. Playfully tell the child to be a parrot and repeat everything you say, just as you say it. Depending on the child, you might say only short, simple words or you could try words that are a bit longer and even short (silly) sentences. Then offer to switch and be the parrot yourself—this will encourage active language use even more. Choose a color and, as you’re driving along (assuming your kids can see out the window), try to spot things of that color. For example, if the chosen color is yellow, perhaps you’ll see a house, a flower, a sign, etc. If the child is unable to name the object, offer the word and encourage repetition. Instead of colors, choose a letter and then look for things that begin with that letter. For example, if the chosen letter is “t”, the players might call out “truck,” “tree,” “tunnel,” or even (but let’s hope not) “tornado.” Continue the game with other letters (or starting syllables) in your target language. One person thinks of a “secret word” and gives a series of clues so the other players can guess what it is. For example, if the word is “banana,” the clues could be: “It’s yellow.” “It grows on trees.” “It’s something you eat.” “Monkeys like it a lot.” The words and clues can be very simple, or more complex, depending on the age and language ability of the child. Every language probably has its own version of this little game. One person says a word (any word or limited to a certain category, like “animals” or “verbs”) and the next person has to say a word that begins with the last letter (or syllable, depending on your language) of the previous word. Continue in this way, word by word, until you exhaust your store of vocabulary (or simply get exhausted). Try posing adjectives to your children, at the appropriate level, and see if they can name a suitable opposite (big/small, silly/serious, etc.). You could do the same sort of activity but, instead of opposites, ask for synonyms (big/huge, silly/wacky, etc.). This is an interesting activity and works well when children are a bit older. One person starts by saying a noun, like “lion.” Then the players, in turn, add individual words that are linked to this starting word. For example, if you start with “lion,” this might be followed by such words as “roar,” “mane,” “claws,” “scary,” “king,” “Africa,” etc. Try a variety of starting nouns (animals, things, places) to stretch your children’s store of vocabulary in the minority language. This activity is basically the old “20 Questions” game, but without a limit to the number of questions. One person thinks of an animal (or something from another category, if you prefer, like “kinds of jobs” or “places in town”), then the other players ask “yes or no” questions to zero in on that animal. For example, the questions could be: “Is it a mammal?” “Does it eat meat?” “Can it run fast?” This is a game that my kids and I play often and it nurtures not only language ability but logical thought. You and your kids tell a story (the sillier, the better) by building it sentence by sentence, one sentence per turn. For example, you start by saying: “Once upon a time a little boy went for a walk in the woods.” Then one child adds: “In the woods he saw a bear.” The next child says: “The bear was sitting under a tree and crying.” Continue in this way, accepting whatever your kids want to contribute. (Basically, my only “rule” is that players can’t immediately dismiss the contribution that came before, like saying: “No, he didn’t really see a bear. He saw a beaver.”) This sort of group storytelling is an effective and engaging language activity which often produces fun results. Of course, many of these activities and games can be useful at home and in other settings, too. Give them a try for some productive fun! 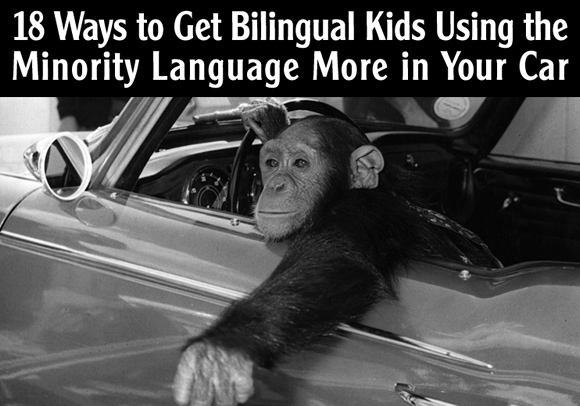 Want more ideas for nurturing the minority language? How about you? Can you add another activity or game that could promote use of the minority language in the car? We have a 20 minute drive every day from school to home, and although I can usually engage my 7 year old for part of the time, after a while, she just needs to relax. Often we listen to music, but just recently I found a podcast pitching science topics at an elementary school level. The first one we listened to (on thunder and lightening) was a bit challenging for her, but she was positive about listening to more! Amy, yes, podcasts in the minority language are another good possibility. And I’m glad you mentioned that these sorts of attempts to boost language exposure should naturally be balanced with the child’s need to rest and relax. It pays to be proactive, but going beyond that, and becoming pushy, could end up being counterproductive. A good barometer of engagement, I think, is the child’s level of interest and enjoyment. Previous post: Make History. Raise a Bilingual Child.